Having just returned from lecturing at the COPD9 meeting in Birmingham, UK, Jadwiga “Wisia” A. Wedzicha, MD, settles into her London office for the phone interview before dashing off to the next commitment this June evening—her mother’s birthday. Navigating multiple requests has become second nature to Dr. Wedzicha, which is an indispensable skill for the next editor-in-chief of the American Journal of Respiratory and Critical Care Medicine (AJRCCM). Dr. Wedzicha will officially take the reins of the AJRCCM from predecessor Jacob Iasha Sznajder, MD, in January 2015. To meet the demanding task of steering the Society’s flagship journal, Dr. Wedzicha will use the insights she’s gained from more than a decade in publishing. Since 2003, she has been a member of the AJRCCM Editorial Board, and she has served as an associate editor since 2013. From 2002 to 2010, Dr. Wedzicha served as editor of Thorax and increased its international standing, submissions, and impact factor. She’s also served as a member of the editorial boards of the British Medical Journal, Polish Respiratory Journal, BioMed Central, and Primary Care Respiratory Journal. She was later asked to chair the European Respiratory Society Publications Committee and develop new strategies. This year, she has been serving as ombudsman of the Lancet, a position she will relinquish as she becomes AJRCCM editor. Dr. Wedzicha also has the distinction of being a highly cited author. For the past 20 years, she has researched with continuous funding the causes and mechanisms of COPD exacerbations, and she has published more than 130 original papers and another 160 invited reviews. “Effect of Exacerbation on Quality of Life in Patients with Chronic Obstructive Pulmonary Disease,” which she contributed to with lead author Terence A.R. Seemungal and published in the AJRCCM in 1998, continues to be one of the journal’s top cited papers on the subject. “Effect of Erythromycin on Exacerbations in COPD,” which she published with lead author Seemungal in the AJRCCM in 2008, is also highly cited and reflects her current research focus on mechanisms of macrolide action. 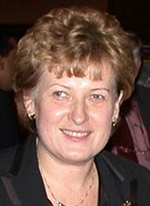 Before joining Imperial College, Dr. Wedzicha had been professor of respiratory medicine at Barts and the London School of Medicine, Queen Mary University London, where her clinical work at the London Chest Hospital included running a home ventilation and sleep unit in addition to the COPD service from 1997 to 2005. The hospital serves primarily socioeconomically poor residents of east London, an experience that inspired her initial research in home oxygen therapy and, in particular, noninvasive ventilation. She then continued her interests in COPD and respiratory research when she moved to University College London and continued to run a home ventilation unit at the Royal Free Hospital. Dr. Wedzicha earned her MB and BS in 1978 and her MD in 1985 from the University of London. She earned membership of the Royal College of Physicians in 1980, and completed fellowships at the Royal College of Physicians in 1994 and the Academy of Medical Sciences in 2013.